This majestic apartment still remains the apartment of His Highness The Maharaja of Jaipur Sawai Padmanabh Singh and can be booked only when he is not in residence. 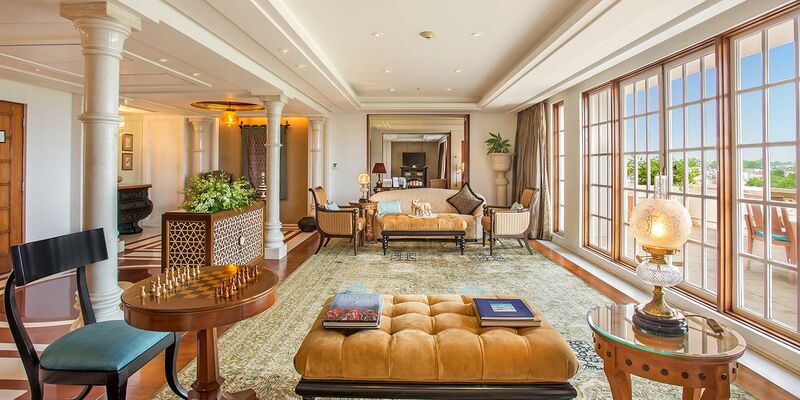 This 3,125 sq feet royal setting has served as the private apartment of two successive Maharaja’s, Sawai Man Singh II and his son Sawai Bhanwani Singh. The opulence and grandeur of the apartment has to be seen to be believed as every aspect of it speaks of grandeur of a regal past. 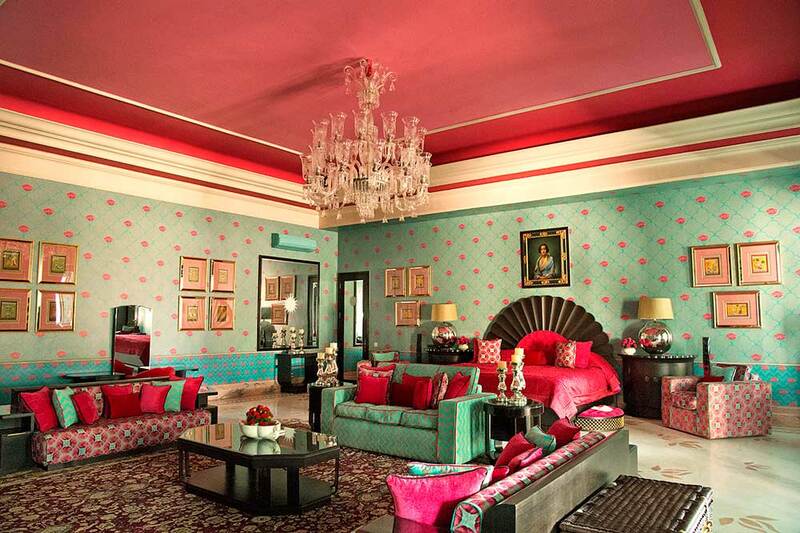 It also has The Yuvraj Suite, which is the second suite belonging to The Maharaja's Apartment. The 2899 sq.ft. apartment is sheer opulence replete with a huge master bedroom, adjoining sitting room that leads into dressing room, en-suite bathroom, an elegant private dining room, full service kitchen and an impressive entrance hall. Double doors lead down to an enclosed private verandah and heated plunge pool. You also have the services of a private butler for the duration of your stay for unmatched personal service. When we checked online, the price on offer seemed a patch for the luxury on offer such as the opulently furnished living and dining rooms, the large private terrace and the most amazing bit – a king size bed in the master bedroom facing one of the seven wonders of the world. 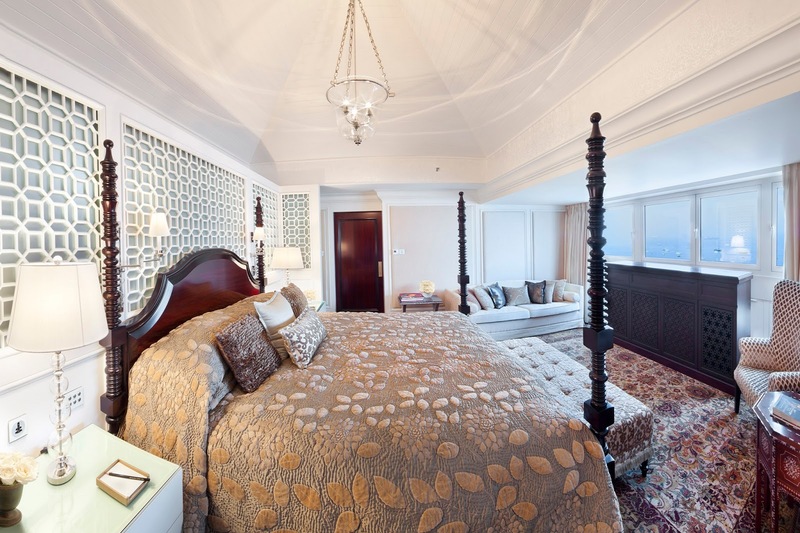 The wall to wall windows offer uninterrupted views of the Taj Mahal from each room for you admire it in privacy. The interiors adorned with white marble elephants and columns, uber comfy bed linens, standalone bathtub and the glass panelled walk in rain shower opening onto the private terrace, surpass your wildest luxury expectations. The 5,000 sq.ft. awe-inspiring Tata Suite is adorned with splendid crystal chandeliers, rich and plush tapestry, rare art, antiques and artefacts, that transports guests into a world of imperial luxury and grandeur. Built on the 6th floor, the sprawling Tata Suite has 15 rooms decorated with furniture, paintings, and artefacts curated from different parts of the world. It has white marble walls, marble elephants and gold inlaid teak wood doors. 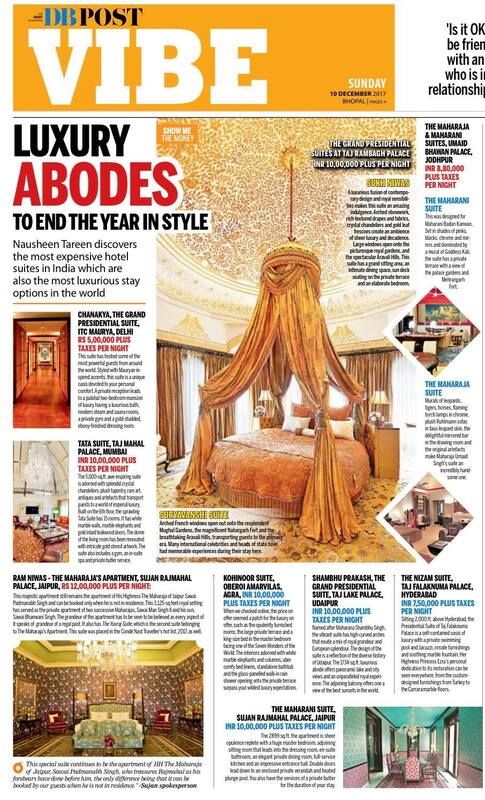 The dome of the living room has been renovated with intricate gold stencil artwork and the room itself has elegant ‘mother of pearl’ tables, silver framed mirrors, royal chandeliers along with glorious red carpets along the corridors. The suite also includes a gym, an in-suite spa and private butler service. It has hosted the top dignitaries and heads of state visiting Mumbai. Named after Maharana Shambhu Singh, the vibrant suite has high curved arches that exude a mix of royal grandeur and European splendour. 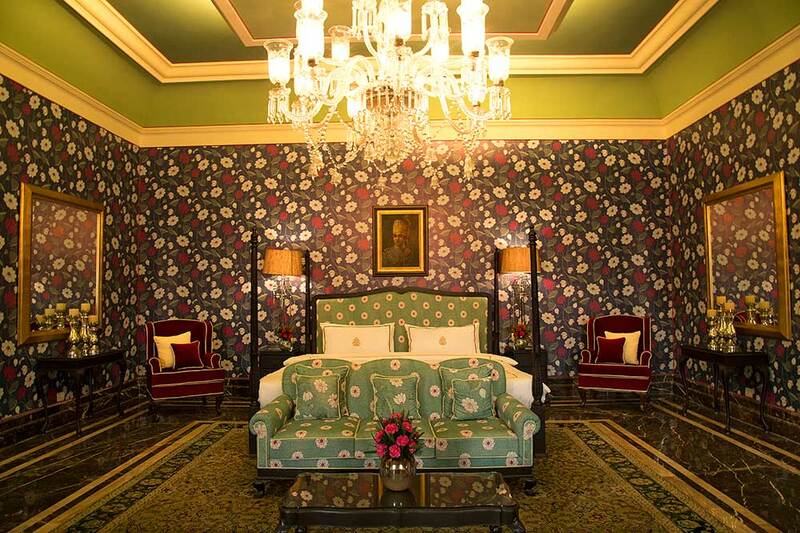 The style and design of the suite are a reflection of the diverse history of Udaipur. The 1734 sq.ft. luxurious abode offers panoramic lake and city views and an unparalleled royal experience. The suite opens out to an adjoining balcony that offers one of the best sunsets in the world. A luxurious fusion of contemporary design and royal sensibilities make this suite an amazing indulgence. Arched stone work, rich textured drapes and fabrics, crystal chandeliers, gold leaf frescoes, opulent furniture and embellishments creates an ambiance of sheer luxury and decadence. Large windows open to the picturesque royal gardens, and the spectacular Aravali hills. This suite has a grand sitting area, an intimate dining space, sun deck seating on the private terrace and an elaborate bedroom. Arched French windows opens out onto the resplendent Mughal gardens, the magnificent Nahargarh Fort and the breath taking Aravali hills transporting guests to the princely era. Many international celebrities and heads of state have had memorable experiences during their stay here. This has to be one suite that has hosted some of the most powerful guests from around the world. From almost every head of the state that has visited India, actors, royalty and sports stars, all have opted for Chanakya as their luxury pad in the capital. Styled with Mauryan inspired accents, the opulent Grand Presidential Suite is a unique oasis devoted to your personal comfort. A private reception leads to a palatial two-bedroom mansion of luxury having a luxurious bath, modern steam and sauna rooms, a private gym and a gold studded, ebony-finished dressing room. This was originally designed for Maharani Badan Kanwan. Set in shades of pinks, blacks, chrome and mirrors, and dominated by a mural of the Goddess Kali, the Suite has a private terrace with a spectacular view of the palace gardens and Mehrangarh Fort. A much earthier and certainly a more masculine mood prevails in Maharaja Umaid Singh's suite just across the crystal fountain separating his suite from his Maharani’s. Murals of leopards, tigers, horses, flaming torch lamps in chrome, plush Ruhlmann sofas in faux leopard skin, the delightful mirrored bar in the drawing room and the original artefacts make this an incredibly handsome suite. Sitting 2,000 ft. above Hyderabad, the Presidential Suite of Taj Falaknuma Palace exudes opulence and incredible grandeur. It is a self-contained oasis of luxury with a private swimming pool and Jacuzzi, ornate furnishings and soothing marble fountain. Her Highness Princess Ezra’s personal dedication to its restoration can be seen everywhere, from the custom-designed furnishings from Turkey, to the Cararra marble floors. It offers a beautifully detailed juxtaposition of period sensibilities and state-of-the-art amenities. Disclaimer: These prices are between the period of December 20, 2017 to January 10, 2018 based on our online search. The images have been taken from respective hotels' websites. Thanks a lot for one’s intriguing write-up. It’s actually exceptional. Searching ahead for this sort of revisions.These are very expensive hotels.for information regarding Best Hotels in India please visit to the link. A Holiday In Mussoorie? Prepare To Be Enchanted! 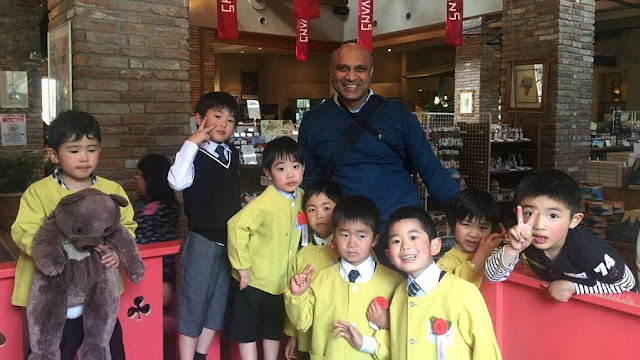 Great blog, learned many things about hotels in india from this blog, very informative. The hotels in kanyakumari is one of the best places to get hotels in india.